This PopApostle's study of the Jurassic Park movies, novels, and comic books such as commentary on the science described, sound bits of memorable dialog, screen grabs and my own musings. I'll be presenting them in my estimation of the chronological order each story takes place. For reviews of the new JP comic books by IDW, I am joined here by fellow geek and friend, Patrick Hayes (you can also find his popular reviews of IDW's current plethora of Star Trek comics on TrekWeb.com and other reviews on SciFiPulse). Pat's Jurassic Park reviews are here: Jurassic Park Reviews). Although there are no television "episodes" in the JP canon, I am continuing to use the term "episode" as I have elsewhere on PopApostle, as a separable piece in the continuous narrative of a larger story. "Genesis" "Jurassic Jam" "Sneakers" "Betrayal" "Heirs to the Thunder"
Millionaire industrialist John Hammond plays his ace to convince his backers that his over-budget, behind schedule, secret new theme park is worth funding. As the park comes closer to completion, security and safety failures foreshadow bigger problems in the future. A problem crops up in the unfinished park just as important visitors arrive. When the park’s systems programmer, Dennis Nedry, sees what is really happening on the island, he begins to believe he underbid for the contract. Two Jurassic Park employees discover the “secret base” of a mad scientist on the island genetically engineering “superior” dinosaurs. Derek and Abby find themselves in jeopardy from the insane Dr. Gustavus. Things go wrong at the soon-to-be-opened theme park featuring the living clones of dinosaurs. When Dennis Nedry fails to show up at the ship with the embryo canister, a BioSyn agent takes action. An InGen rescue team arrives on the island. Our heroes make their way through the maintenance tunnel system of the park, but continue to be pursued by raptors...and encounter something else as well. "The Survivors" "Aftershocks" "Dark Cargo" "Rush" "Photo Finish"
Our heroes come to the end game. Grant and Ellie are brought back to Isla Nublar to help advise the U.S. Army on reigning in the loose dinosaurs on the island. Lawala kidnaps Grant and Ellie as he also smuggles the raptors off the island. After crash-landing in the Columbian jungle, Grant and Ellie are held prisoner by a drug lord who has them caring for the raptors he has also captured and plans to use as the ultimate attack dogs. The U.S. Army gains control of Isla Nublar and Derek and Abby return as part of the InGen crew. Part 2 "Animals/Men" "Animals/Gods" "Gods/Men" "The Wild"
Derek and Abby seek to prove Abby’s innocence in the photo fiasco. Rafael sets in motion his plan to use the raptors. With Rafael dead, Grant and Ellie escape to civilization. But the raptors have also escaped…into the Columbian jungle. Seeking to avenge the death of Lawala, Muldoon organizes a safari into the Columbian jungle to track down the raptors. A new researcher and a mysterious ape encounter the fleeing raptors. "Civilization" "Fever" "Trapped" "No Man's Land" "No Woman's Land"
Hammond’s retaliation against Biosyn starts an inter-corporate war with our expedition caught in the middle. Dr. Fischer returns, now working for Biosyn; the raptors build their nest. Biosyn pens in the raptors. Hammond finds himself blocked off from his own island by the U.S. Army, so he clandestinely sends in his “team” to investigate. Hammond’s team discovers that Biosyn has also sent in a team to infiltrate Isla Nublar, now under control of the U.S. Army. The InGen and Biosyn groups join together for a trek through the jungle of Isla Nublar to the military base and the source of the Green Flame. 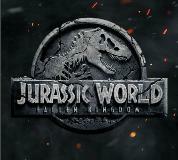 The group must flee the renegade soldiers and an enraged Tyrannosaurus to escape from Isla Nublar. A drug lord buys Isla Nublar from the Costa Rican government and turns it into his headquarters. Agent Espinoza is rescued by a female dinosaur researcher who has "gone wild" on Isla Nublar. But is she friend or foe? Agent Espinoza duels the assassin Tiburon in a dinosaur-infested jungle. "Dangerous Games" Part 4 "Dangerous Games" Part 5 "Death Lizards"
Espinoza plots his escape from the island. Agent Espinoza's showdown with the dinosaurs of Isla Nublar and the drug lord Cazares. Hammond reveals the existence of a second island full of dinosaurs. Originally a hatchery, he now means to leave it as a nature preserve for dinosaurs. But trouble there brings Dr. Ian Malcolm back into harm’s way. Excerpts from the memoir of John Hammond on his most famous (or infamous) creation. A pack of Dilophosaurs makes themselves known in Costa Rica. In an unfortunate accident, 13-year old Eric Kirby becomes stranded alone on Isla Sorna. Strapped for cash for his work, Dr. Alan Grant agrees to lead an aerial tour of Isla Sorna…but during the tour chaos takes a hand. Dr. Grant heads up a UN project to protect and study Isla Sorna and the dinosaurs living on it. While he supervises construction of an outpost, a group of reckless teenagers illegally parachutes onto the island to shoot a documentary. The escaped pterosaurs from Isla Sorna migrate to Orlando, Florida, where they terrorize the Universal Studios theme park. 13 years after the failure at Jurassic Park, Lex continues to fight to keep the islands isolated. Tim, meanwhile…does he have other plans? "Redemption" Part 2 "Redemption" Part 3 "Redemption" Part 4 "Redemption" Part 5 "The Devils in the Desert"
The escaped Carnotaurus wreaks havoc outside Glen Rose, Texas. Tim and Lex begin independent investigations of the goings-on in Glen Rose. Dinosaurs stampede through the town of Glen Rose. Dinosaurs on the loose in Glen Rose and a Giganotosaurus about to stomp through the local nuclear power plant! Not. Good. Cattle and people begin turning up mutilated near a small desert town. "The Devils in the Desert"
Part 2 "The Devils in the Desert"
Part 3 "The Devils in the Desert"
Sheriff and FBI versus Pteranodons! InGen takes a hand. Sheriff Tobias and Dr. Alvarez chase the Pteranodons to the conclusion! Several years after a living-dinosaur theme park finally opens on Isla Nublar, InGen scientists take things a little too far with fearsome new hybrid. After the fall of the Jurassic World theme park, Claire Dearing reflects on the events that led her there in the first place. After the fall of the Jurassic World theme park on Isla Nublar, an ethically-questionable plan to sell the dinosaurs to global power-brokers is hatched clandestinely.